Happy Thanksgiving to all US crafty Friends!!! I'm very Thankful for all blog followers! I really appreciate your support and lovely comments. Today I have a GIVEAWAY for my Blog Followers only..
...my little way of saying Thanks!! I'm giving away a $50 ART IMPRESSIONS stamps Gift Certificate . This GIVEAWAY is open for all my BLOG FOLLOWERS only , all round the Globe. You can FOLLOW my Blog...links are on the sidebar. You can LIKE my FACKBOOK page.
" Whats on CRAFTY wishlist from SANTA?" A Magentic Platfrom for my Evolution Advance. This Giveaway open till November 30th, 2014. I'll pick a winner on Dec 1st. Next two weeks will be very busy here, I have few Blog hops and lots of Giveaway coming up!!! The wood veneer leaf is from Nine & Co. Through The Craft Room Door- Anything Goes. Going Grey With Scrap-Creations- Give Thanks. I have two cards over at Butterfly Reflections, Ink blog , stop by to check it out. 30% of on Entire order including sale items , now through 12/1. Have a great Turkey day and enjoy BLACK FRIDAY shopping!! Thanks for the give-away! On my crafty wishlist is a Silhouette, although I don't think it actually will appear...I am following your blog now for a while. Now I'm going to have to find out what an Evolution Advance is... and then maybe it will be on my list too lol. But for my Christmas crafty wishlist I would love a personalized stamp for the back of my cards, I think that would be so indulgent! Thanks for the chance to win and for all the inspiration over the past year! I love the CAS style and neutral colors of the card! TFS! Thank you so much for the giveaway. I honestly haven't given my wishlist any thought bc I know Santa won't stop here this year- but if I did get to wish, I'd be happy with just about anything crafty I got! There are some dies and stamps, etc I'd LOVE to get. Have a wonderful holiday; I've been following you for quite a while now and I enjoy every minute of it!! How sweet of you to do this!! On my craft wish list is more copic markers! Wow- what a great card! Thanks for sharing it with us at Through the Craft Room Door and hope to see you again soon! I am wishing for the gift box punch board from Santa. Hmmmm....on my crafty wish list is a new camera lens and more stitched shape dies. Thanks for the chance to win!! My crafty wishes are to win this gift card, I love AI. My other wishes are going to be put on hold until well after the new year, probably April or so...I'd love to get a Cameo Sillhouette. Thanks for the chance to win and the wonderful gift. Thanks for your generous giveaway! I am hoping for some new impression plates! 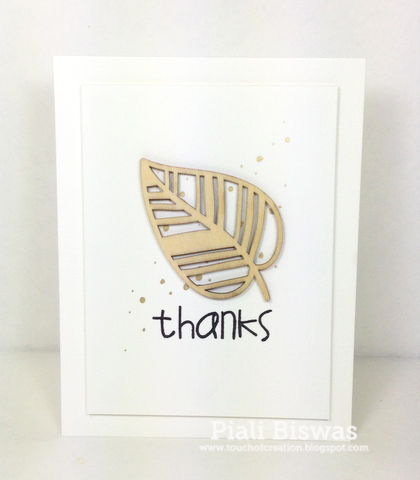 Beautiful card, Piali & such a generous give away. I want more creative ideas to use whatever i have in a totally different way...:). Thanks for the chance! On my crafty wish list is corner chompers! I like your version of CAS. So lovely! A clean and ELEGANT card Piali!! Thank you for sharing with us at Fresh Brewed Designs...good luck!! my wish list is only one thing! a cameo!!!!! thanks for the chance to win! oh I love it Piali. CAS perfection. I love the splatter bg. awesome creation... on my wish list... well my goal this year is to own all the stamps from Art impressions... so i will pick that. Thanks for a chance. My crafty wish is for a silhouette machine. I've wanted one for ages. Any crafting machine would be nice, really.